Sunday May 7th 2:00 PM. Advance registrations required. Call 845.634.4997 to register. We will journey through 2,000 years of Jewish history in Austria and Vienna, from the Roman times and Middle Ages, to the Enlightenment and Fin de siècle. We discuss distinguished contributions the Jews of Vienna made to the creation of that city’s great culture: from music to medicine, from arts to philosophy. Then we travel from Vienna of the Waltzes to Vienna of the Dead: from Habsburg palaces to Leopoldstadt, a former neighborhood of vibrant Jewish life turned into a ghetto after the Anschluss. 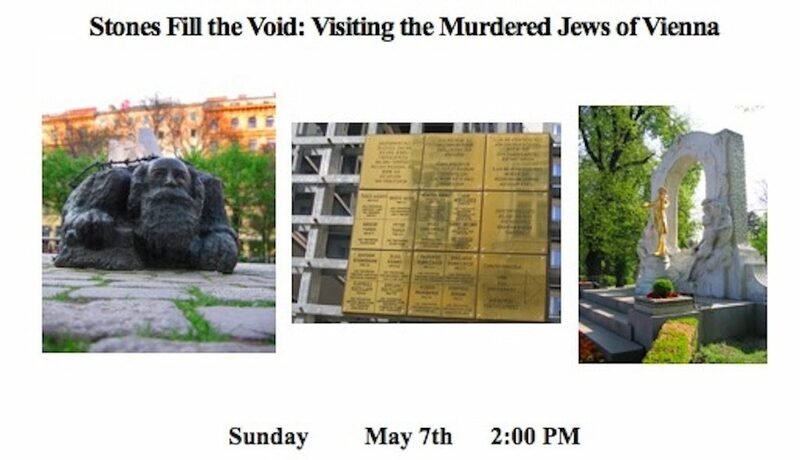 We will follow the “Stepping Stones,” the brass plates with names of the victims and learn their stories along with a peculiar Austrian response to the Holocaust. Irene will introduce her latest book “The Dao of Being Jewish and Other Stories: Seeking Jewish Narrative All Over the World.” The book signing follows the presentation. This entry was posted in Europe, General, History, Holocaust, Jewish Story and tagged anti-semitism, antisemitism, Europe, Europe history, lecture, trip to Europe, Vienna, WWII. Bookmark the permalink.